Since beginning its National Pancake Day celebration in 2006, IHOP restaurants have raised almost $16 million to support charities in the communities in which they operate. 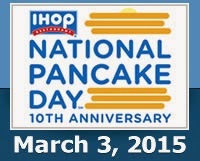 On March 3, 2015, IHOP guests from around the country will celebrate a "Decade of Giving" with the tenth annual National Pancake Day at IHOP restaurants and enjoy a FREE short stack of Buttermilk pancakes. In return for the free pancakes, guests will be asked to consider leaving a donation for Children's Miracle Network Hospitals© ** or other designated local charities. The Goal this year is $3.5 million for charity!